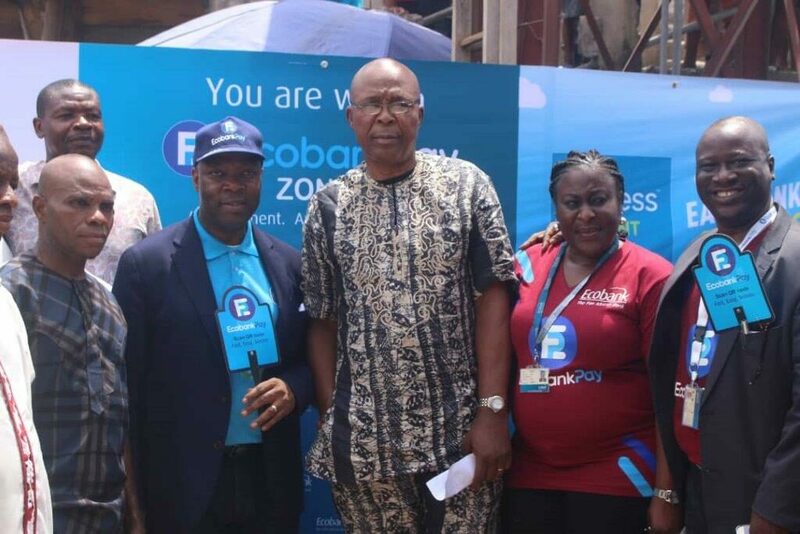 Ecobank Nigeria has taken its digital product, EcobankPay Zone to the South East market with a launch at the popular Ariaria Market, Aba. Managing Director, Ecobank Nigeria, Patrick Akinwuntan while launching the product at the market said it will facilitate easy, secure and convenient transactions for merchants within Ariaria and other surrounding markets. The EcobankPay Zone is a digital payment hub enabling businesses within a location adopt Ecobank’s wide range of digital products for ease of payments for goods and services. “It is our determination to create ease of payment and boost economic activities most especially in a town like Aba, renowned for indigenous production of shoes and textiles. Our digital offering will be an opportunity for both buyers and sellers to increase their sales in an enhanced and secured way and without fear. The EcobankPay digital hub makes it easy for the seller to be paid instantly and buyers pay with ease and also have rest of mind associated with doing business without carrying cash around. Our Xpress point is also around for you to transact with ease, in as much as you have your phone you can bank with Ecobank. “The initiative of the Ecobankpay zone is to deepen financial inclusion in the communities and specifically aid business transactions between merchants and clients. EcobankPay’s unique offering is that anyone from any bank in Nigeria can pay with MasterPass, mVISA and mCASH with any phone by scanning QR code or using USSD”. “if the person that wishes to buy goods from you is coming from a bank that has mVisa and wishes to pay, the same QRcode would accept an mVisa payment and vice versa. That creates synergy between us and the other banks and convenience for the merchants. And as you know, the QRcode is much cheaper than having a point of sale (PoS),” he said. Mr Akinwuntan made an example of how the EcobankPay works by buying a pair of shoes from one of the Aba traders and make payment through QR scan and the seller received alert instantly. EcobankPay is a fresh innovative payment solution that enhances transactions between merchants and their customers by eliminating risk of payment rejection and also delivers same day value and sales transparency for merchants. This is unlike the traditional ways that payments are made using cards on PoS where merchant, the small business person, the trader, the supermarket owner, the distributor that is holding a POS needs to wait for at least one day to get the value of the payment. EcobankPay enables the merchant receive credit instantly. This is very important for working capital particularly for small businesses. Ecobankpay enables easy tracking of customers business profiling for quick access to credit, save faster, reduces the risk of security in terms of exposure to cash or exposure to pilfering of merchant’s credentials. The beauty of the Ecobankpay is in the cost of setting up as the shop owner simply print the QR code on a paper and can stick it anywhere and do not run any risks”.